Since my fortieth birthday and beginning analysis, I’d decided to teach myself to cook. Not only did I want to leave behind my past life as a junkfood junkie, but I wanted finally to realize my dream of having friends over for dinner. Anna and I were working on the phone phobia, so I wanted to have some recipes under my belt when I finally found the courage to invite people into my home. I ordered this gorgeous cookbook from Amazon. Oh, my. That was thirty dollars well spent. This book has rich glossy photos, poetry, lore, explanations of celebrations and holidays, a wedding meal, recipes for salads, drinks, cookies and pastries…you name it. I decided to learn to make zereshk polo baa morgh or barberry rice with chicken, the recipe featured on the cover of the hefty cookbook. To this day, the preparation of this dish is one of the most meditative and sensual exercises I know. First of all, if you want to go completely traditional, which I do, you need ghee. So I start by making a batch of my own ghee the day before.Also done the day before is the rinsing of the basmati rice–five times or until the water runs clear. Then you leave the rice to soak overnight in very salty water (2 tablespoons salt in 8 cups of water). This helps the long grains hold up better when cooked. It ensures a fluffy rice. I usually leave the rice and salt water resting atop my refrigerator and put a large round glass serving dish on top to keep dust and things out. Place the whole chicken in a baking dish. Stuff the bird with one of the whole onions, the garlic, and sprinkle with salt, pepper and 1 teaspoon saffron water. Cover and bake in a 350 F oven for 1.5 to 2 hours. Oh, how I love that moment on day 2 when it’s time to take the lid off the soaking rice and put my face down near the fragrant basmati water. Breathe in deeply. Aahh, there’s nothing like it. You rinse out all the salt using a colander and/or two bowls. This takes a lot of swishing and pouring from one bowl to another. I use my bare hands. It’s relaxing. Saute 1 sliced onion in 2 tablespoons butter, add barberries and saute for just 1 minute over LOW heat because barberries burn very easily! Add 4 Tablespoons sugar, mix well, and set aside. Bring 8 cups water and 2 tablespoons salt to a boil in a large, non-stick pot. Pour the washed and drained rice into the pot. Boil briskly for 6 to 10 minutes, gently stirring twice to loosen any grains that may have stuck to the bottom. Bite a few grains; if the rice feels soft, it is ready to be drained. Drain rice in a large, fine-mesh colander and rince in 2 or 3 cups lukewarm water. While the rice is parboiling, you can put your saffron strings into the mortar with a bit of sugar and grind it to a fine orange powder. A few tablespoons of hot water added to this makes the key ingredient that will go on the chicken and also into the rice. Be careful! This mixture stains fingers and countertops and, well, everything it touches. In a bowl, mix 2 spatulas of rice, the yogurt, and a few drops of saffron water and spread the mixture over the bottom of the pot to form a tender crust (tag-dig). Cover and cook for 10 minutes over medium heat. Mix the remaining melted butter and saffron water with 1/4 cup of water and pour over the pyramid. Place a clean tea towel over the pot; cover firmly with the lid to prevent steam from escaping. Cook for 50 minutes or longer over low heat. Before the rice is done cooking, wet down a tea towel with cold water. When the rice is done cooking, set the hot pot of rice down on the cold towel. This helps release the tadig from the bottom of the pot. Decorate the top of the mound with almonds and pistachios. Mix all the ground spices together in a bowl. Store in an airtight container to preserve freshness. If I ever make this dish for you, it means I love you. 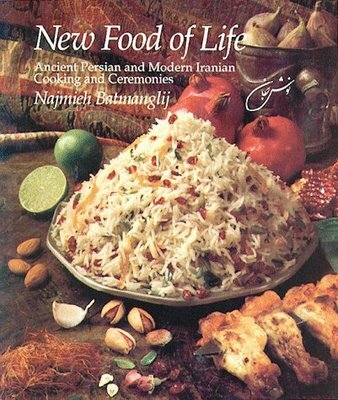 This entry was posted in Age 40 to 49, Food, Friendship & Friends, Persia and Things Persian, Recipes. Bookmark the permalink. i make it slightly differently.soaking the rice and zereskh yes the same way.excpet thati saute some onions with youghrt and ghee then pour the parboiled rice mix over it.then the spice powder,and zafran water, and zereskh.aluminium foil to seal the pot, and then tight fitting lid. high heat for abt 5 mins, thnlowermost heat for abt-30-40 mins. yes wet finger works for me too.but usually by the smell i know its done. Please leave a comment if you used this recipe and liked it, or if you bought the beautiful cookbook! In Toronto, you can get golpar and dried rose petals at Pars Bakery on Finch between Yonge and Steeles. Salam Kikipotamus jan! Khubid? Farsi-am cheytor-e? Through sheer serendipity I found your blog and I find it absolutely delightful. I was online searching for the next nokhodi book to continue my dars e Farsi when your blog appeared at the top of my results list. The book is truly wonderful, and the stories make me so happy with their simplicity and wackiness. I love them. I will try to order the second or third volume. I also bought this cookbook. If you don’t have it, this same author wrote another amazing cookbook call Silkroad Cooking: A Vegetarian Journey filled with stories, anecdotes, and poems from the best of Iran, Hafez and Rumi. Best of luck with your studies from one Iran-o-phile to another! Thank you for the kind reply acknowledging my comment. I feel a bit embarrassed! I intended to ask you about your progress with Persian. I apologize. Here’s what I wanted to say: farsi-etoon cheytor-e (coming along)? It’s so frustrating to repeat the same mistakes over and over. Thank you for your patience. I’m so pleased that you have heard about the Silk Road cook book. I recommend the Kurdish chickpea recipe. Watch out! It can give you a gentle kick!